The purpose of the Friends of St. Vincent Park is to oversee the park, coordinate the volunteer activities of parishioners and others, and assist in negotiating for outside assistance in park maintenance. All who wish to bring donations of food to those in the park must be registered on our park calendar. To get on this calendar, please use the contact information listed above. See this Letter to see why we decided to coordinate the park donors. Leave nothing. Take unused donations with you. Bag and remove trash. Place any litter found in Park in cans or closed bags and take to the curb. Take all activities inside the Park. Do not use the sidewalk or street, church steps or parking lot to set up and give out donations. Honor the Sunday morning hours of worship. No donations or ministry groups until 1:00 PM on Sundays without express permission from the church. 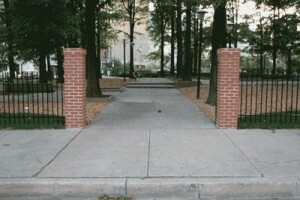 In the 1960’s, Baltimore City created a park next to St. Vincent. The park became a favored hangout for those experiencing homelessness or near-homelessness—some of whom slept in the park. Their right to do so was defended by Fr. Lawrence when St. Vincent purchased the property in 2000. In time, the park became a popular place for charitable donations of clothing and food, and mission visits from area churches. Donors brought food, clothing, tents, tarps and mattresses, and some people set up semi-permanent shelters in the park. Today, anyone who must is allowed to sleep in the park, but no one may encamp there. St Vincent’s closes the park every day from 7-9 AM for cleaning, and all items must be removed from the park at this time.